Hurrah for Selfridges! 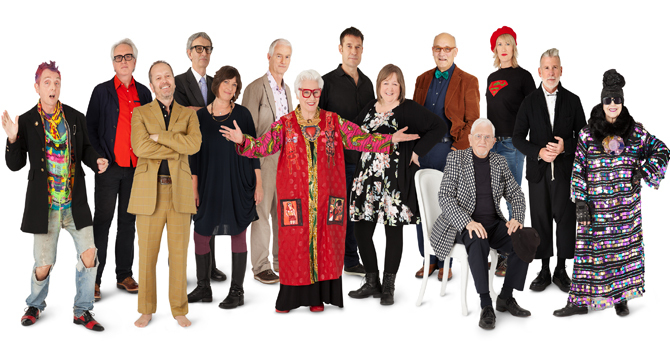 While other retailers are accused of ignoring the older customer (more here) in January 2015, Selfridges stores will be celebrating Bright Old Things, featuring 14 properly grown up people who have rebooted their careers at a point when many expect us to slow down. Fans of Selfridges may know it’s Bright Young Things concept, which highlights up and coming young designers and artists. Well, Bright Old Things (or BOTS as we’ll be calling them) looks at up-and-coming older creatives who have approached the latter part of their working life and thought ‘Let’s do something else’. They’ve either retrained, had a ‘retirement renaissance’ as Selfridges has called it or got on with doing something they love. The VERY exciting news it that Amanda’s very own middleagedad, Roger Miles, is one of the 14 (he’s second left, in the bright orange Opening Ceremony shirt). Roger, you may remember from this interview, has retrained as an artist, having previously been a successful accountant (hard to make that sound exciting, I know, but he’s making up for it now). All of them get their own Oxford Street window to design, Roger’s is window six and it’s going to be VERY exciting. The BOTS will be selling their work within the store too and during January and February there will be special events (to be announced) including a few around London Collection: Men. Todd Selby from The Selby, has also been recruited to photograph all the BOTs in their creative spaces (MUCH more about Todd’s visit on a later post….can you imagine what sort of a spin that put me in?!) and will be documenting this on the Selfridges website during the promotion. Roger has met a few of his other BOTS, including the fabulous Molly Parkin, founder of Nova, who is now a talented artist. Regular readers will also recognise our favourite Sue Kreitzman, who has featured on TWR before. There’s also a topiary artist who used to be an architect, a furniture designer and a product designer turned inter-space broadcaster (you might like to check him out here, he’s fabulous). So hurrah for Selfridges, for acknowledging that older people today are a fascinating, inspiring and busy bunch of people worth focussing on. Now we’re all supposed to be working till we’re 70 odd, many of us will reach mid life and think ‘I need to do something different’. Hopefully Bright Old Things will inspire and motivate many to find an alternative and perhaps more fulfilling second half to their working lives. As our very own BOT has said before (inspired by Neil Young) it’s ‘less retire, more re-tread’. So Roger, how do you feel about being a Bright Old Thing? ‘I’ll take being called bright any day, thanks’. Well done MAD and other co – BOTS, a total inspiration – CANNOT wait for the installation (Stands on chair and claps wildly)! !